Once again I’m a bit late, but it doesn’t detract from an incredible visit from The Grandmaster Of The Shaolin Art! This was his 2nd visit to our small school in Cork City, Ireland. He was Welcomed with Great excitement from the long lived & brand new students! I nearly brushed off the call at 4am in the morning from California thinking that it was only a misdial. Thank Goodness the notification for a message sent to voice mail was loud enough to wake me from my sleepy daze so that I can jump into action! Grandmaster The’ left a message saying that he will be coming a day earlier because the airline decided to cancel his flight! There was a bit of a scramble, but it was well worth it as it afforded us the opportunity to spend an AMAZING time exploring the National Botanical Gardens in Dublin (http://botanicgardens.ie/ )! With the extra day, the Grandmaster was able to rest up after a 10hr flight and adjust to the 8hr time difference. So on the Friday he was fresh and eager to take the ferry and spend another Fantastic day exploring Garnish Island (http://www.garnishisland.com/ )! On the Saturday we had a nice morning walk and saw the Ogm Stone at UCC, then a stroll through Fitsgerald Park to see Cork icon “The Shaky Bridge”. After lunch we had our grading. 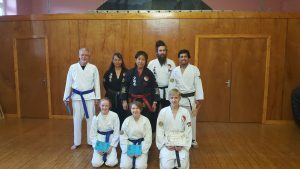 Congratulations to Nava, Gabriel on their advancement to Brown Belt, & to Luisa, Frank & Ruby on their advancement to Blue Belt! After dinner we treated The Grandmaster to some Traditional Irish Music Session where one of our very own black belts, Conni Dawson, also known as “The Street Harpest” brought our her harp and played for us all! On Sunday we learn a FANTASTIC form! The Tai Chi Short Stick ( The Stick That Subdued The Dog) was Unbelievable! I can speak for all my students that attended, we were all in awe! The students, myself included, learn so much and heard some Great stories! There are just not enough endearing words to describe the AMAZING weekend! It was sad to see The Grandmaster leave. We all can not Thank him enough for taking the time out of his busy schedule to come to our little Island to visit our modest school! 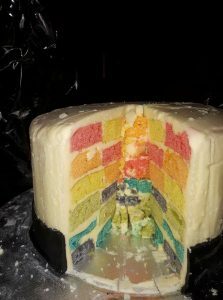 Here is another post that I’m rather late in writing, though we are still celebrating our 10 yea anniversary. The actual date was on back on 14th February. I want to go on and on and say how amazing it all has been and list off all the supporters, and, contributors over the years, as well as an agonizingly long Thank You list as if we won an Oscar or a Grammy. But I hope we showed our utmost appreciation at the time to such and extend that this post would simply be overkill. The truth of the matter, as well, is that it hasn’t been all amazing. We’ve gone through some really rocky times. We practically had to start over 3x. So fingers crossed that 3rd times a charm! As the instructor, there were times that I my motivation and enthusiasm waned, where I wanted to let it all go, for the security of a 9 to 5 job and a steady paycheck. But we all stuck it out and made it through! Now I wouldn’t give this up .. .I just won’t. At risk at sounding cliché, the road ahead will not be easy, but it sure will be interesting! Here’s to 10 Years In The Making! And here’s 10 More Years To Make! What a Fantastic Weekend we had learning the Yin & Yang Dagger form from Elder Master Keller! Elder Master Keller is an 8th Degree Black Belt in Shaolin under Grand Master Sin Kwang The. He also teaches at his own school in Boise Idaho. It was a real treat for him to come all the way from Boise to Ireland and the students were thrilled. We hope that he will make the journey again soon! Yes, I’m late in posting this! Regardless there was GREAT fun had at our Pub Quiz & Raffle to raise money to bring Grand Master The back to Ireland in October. We even had a good turn out from “career” pub quiz competitors! The raffle prizes that were donated were AMAZING! They included a dinner for at the Quay Co-Op, 2 GORGEOUS cakes made by Ruby & Ava, a gift basket by Frank, treat bag from Hendrick and many more! Sure the questions were hard, so they tell me, but they were hard for everyone so at least the playing field was even! All said and done we managed to raise enough money to pay for the Grand Master’s accommodation while he is here! Unfortunately, so busy with my feeble attempt at quiz matering that I totally spaced taking photos. 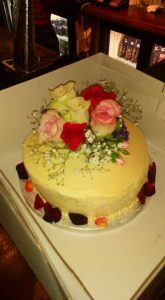 I had to nab the photos of the cake from the ones who won them! THANK YOU EVERYONE WHO SUPPORTED, PARTICIPATED, CONTRIBUTED! 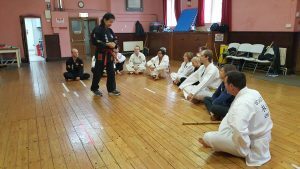 What an Amazing turn out for Beginning Belt class on Sat 27 Jan 18! I can go on and on about how proud I am of the students and how honoured I am to be their instructor. Through out the last 10 years like many other schools we’ve had our ups and down while being processed through a meat grinder. There were times when I thought I would have to close the school. There were days that not a single student showed up. But on Saturday all the trials and tribulations that this school has been through was all worth it to see a record number of students show up. I know that the road is going to rough, but I’m confident in the students to navigate through the bumpy bits. Here’s the biggest shout I can give on line to all the Shaolin Martial Arts Academy Students past present and future! We all do it. We have grand plans to train hard, over the Winter the break, but with the festive season, we indulge and for good reason. So coming back after all the cakes, and sweets, and gravy, and chocolate and more cakes and…. It’s hard. But we all have to remember that WE ALL DO IT and when you show up for that first day back you know that EVERYONE is in the same boat to suffer thought together! 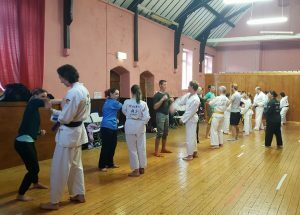 On Saturday 1 October 2016 The Chinese Shao-Lin Centre changed it’s name to The Shaolin Martial Arts Academy – Cork, Eire & moved from the Ballyphehane Community Centre to St. Fin Barre’s Cathedral Hall, on Dean Street. It was sad to leave a place we called home for nearly 9 years, but the potential of the new place are plentiful and inspiring! There’s always the fear that you’ll lose about 1/3 of your students when you move, but I am thrilled to say (touch wood) that we managed to keep all our students and even gained a few more! I believe that we will be very happy in the new place and that it will make a very good home for us for many years to come!